SAN DIEGO, CA – “That’s not golf,” remarked a friend upon hearing I was planning to tee it up at a golf simulator, hoping to groove my swing with the aid of a launch monitor. My friend’s attitude used to be fairly common, though with companies like Full Swing Golf in San Diego, California, impressions are changing rapidly. Simulators have come a long way from the days when you probably first tried one in a bar as something to do after tiring of being thrown by the mechanical bull. After seeing the latest from Full Swing, I’m convinced that not only are simulators “true” golf, they’re going to be instrumental in improving the game in the decades to come. It’s no secret golf is struggling to attract newcomers – and retain dissatisfied long-time players – so simulators just might provide an avenue to do it. 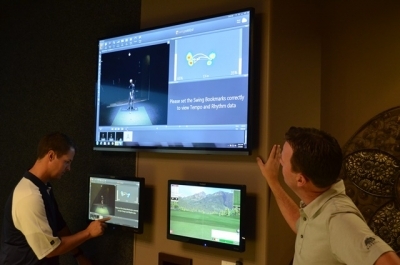 Chad Coleman, Full Swing Golf’s Vice President of Sales and Marketing, says simulators are a powerful asset to the game of golf (the full interview is below). We agree. The Full Swing simulator allows you to practice all sorts of shots, including draws and fades. 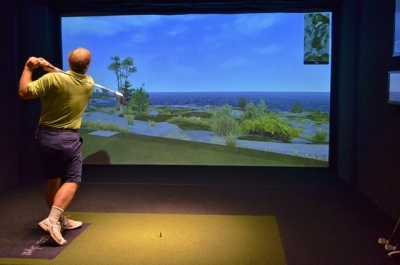 GolfTheUnitedStates.com: In this day and age, golf simulators are fairly common. What separates Full Swing from your competitors? Coleman: There are 4 characteristics that set us apart from the competition: Accuracy, Realism, Quality and Reliability. Our dual-tracking technology (infrared tracks + high speed camera) measures ball-flight characteristics with more precision and accuracy, which contributes to a realistic experience for the golfer. Our technology uses infrared light, which means the ball data is processed at light speed and is rendered in realtime. With other systems, you will notice a “hiccup” between when the ball hits the screen and when the virtual ball begins flying. In the FSG, the transition is seamless and instantaneous. Raw data reveals whether you are making good contact or just getting by. We offer 86 championship courses on the E6 platform, where our waves crash, our trees blow, our clouds roll, and our streams run; other systems use static images or graphics. FSG uses high-quality components in our systems, including a heavy-duty enclosure that houses our cutting-edge ball-tracking technologies, high performance PCs and projectors, and long lasting hitting mats and screens. Other systems require frequent calibration or utilize temperamental technologies; the FSG sim uses stationary technologies that do not require calibration. We have systems that have been in constant operation since the early 90’s. GolfTheUnitedStates.com: Describe your target customer for a Full Swing simulator. What percentage of your business is commercial (retail stores, etc) versus recreational users? Is it used more for teaching or fun? Coleman: About half of our simulators go into high-end homes, for the affluent golf enthusiast who wants to improve and enjoy the game in the comfort and convenience of home. Using the data from Full Swing and Swing Catalyst, Chad Coleman and Joe Rathburn saw promise in the swing of this young player. Our residential customers include PGA Pros like Bill Haas, Hunter Mahan, Ian Poulter and Mark Wilson, who use our sims for serious practice. Thousands of world leaders in business, politics, athletics and entertainment choose the FSG sim for their homes. We recognize that not everyone has the space or can afford our price tag, but those who get a taste of the FSG experience and have the means can make it happen or get creative. We hear countless success stories from residential customers, from cutting handicaps in half to spending unprecedented family time together… both scenarios are hard to put a price tag on. The other half of our business includes various commercial applications, such as golf retail shops, teaching and training facilities, health and fitness clubs, sports bars, rec centers, indoor golf centers, clubhouses at private and public golf clubs, amenity spaces in apartment buildings and retirement communities, and many more. Our sim does teaching and fun very well, sometimes at the same time. 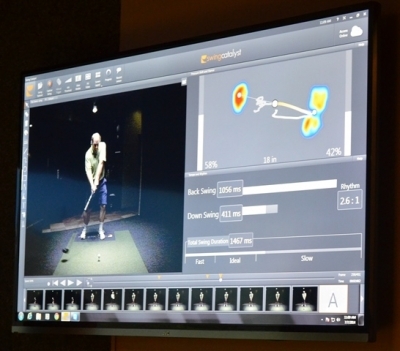 Some of our customers use our sim for serious club-fitting, teaching and training, and serious game improvement; our sim provides the high-level accuracy and relevant data needed to be successful in those areas. And then some of our customers just want to play great courses with friends and family; our sim is user-friendly, realistic, and looks and plays just like real golf -- it’s so much fun and the perfect complement to outdoor golf. 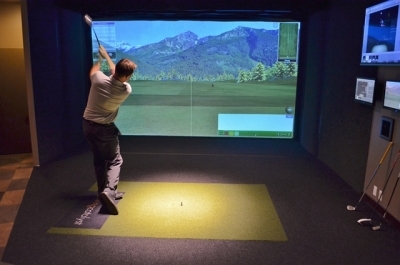 The Full Swing simulator is great for golfers of all ages. 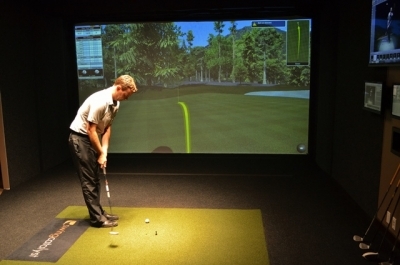 GolfTheUnitedStates.com: What kind of footprint would you need in your home to install a simulator? Coleman: We have a dozen sizes to accommodate almost any space. Our smallest footprint is 11’6” W x 18’ L x 8’6” H, though we prefer to have more ceiling clearance for any and all golfer body-types and swings. Our flagship product, the Widescreen Champion is 16’6” W x 20’L x 10’H, which features a 210” screen and 1080p native resolution and 86 championship courses. We like to put in the biggest machine that fits in the given space. GolfTheUnitedStates.com: In layman's language, how does the technology work? How does the simulator calculate distance, direction, etc…? 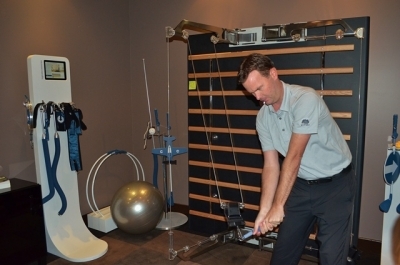 The right exercise equipment can help you physically improve your golf swing. Coleman: Full Swing Golf uses dual technology to track the ball and the club. We use infrared tracks, built into the enclosure near the screen, to track ball speed, launch angle, and direction. There are 688 infrared sensors inside of two staggered tracks near the screen, creating two invisible windows of infrared light. As the ball flies from the mat to the screen, the ball displaces the infrared light array in both tracks, giving us exact coordinates for exact speed, launch angle and direction of the ball-flight as it hits the screen. An overhead high-speed camera, called Ion2 Vision Technology, measures club speed, club path, club face angle, and ball spin. These data sets are combined and instantaneously infused into the software which renders the shot result in a simulated ball-flight that would match the outdoor result. One of the best parts of our simulator is that all of this data capture and rendering happens in real-time, seamlessly connecting the real ball to the virtual ball. 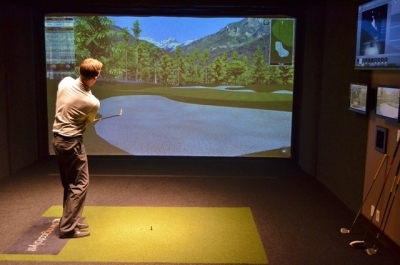 GolfTheUnitedStates.com: Describe the adjustability in a simulator. Can you adjust green speeds, etc.? Short shots are accurately depicted on Full Swing simulators. Here, Joe Rathburn chips over a bunker. Coleman: The FSG sim can be simple or it can be highly customizable. If you’d like to get to the range ASAP, it’s literally 2 touches to the touchscreen and you’re hitting balls with default settings. If you’d like to customize your experience, you can change nearly every element of the game. You can choose the green speed and hardness, the fairway hardness and elevation. You can choose easy, medium or hard pin positions. You can manipulate the wind or even rain. You can choose a tracer, a camera mode, watch fly-bys, zoom to pin, or measure distances to hazards and bunkers. Finally, you have 36 formats to choose from, including stroke, match, best ball, scramble, stable ford, and many more. Virtually every part of the experience can be tailored to the golfers' preferences. GolfTheUnitedStates.com: Can the simulator account for the differences in balls/clubs? Every manufacturer claims their balls/clubs are the longest... can the simulator back them up? It is amazing to see how you can improve your putting by staying indoors. 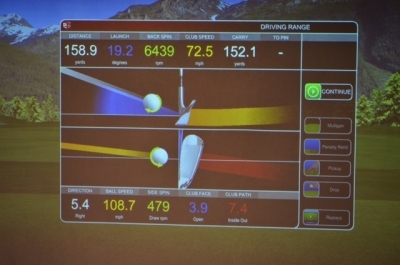 Coleman: The simulator doesn’t care which club or ball you are using -- it doesn’t ask, so it’s not biased. The simulator simply reads the data. It collects ball speed, launch angle, direction, spin and other data points -- and then renders the true ball-flight. One golfer’s 9-iron might look like another golfer’s 7-iron, but our sim isn’t tied to club details in order to perform with a high degree of accuracy. Regarding variations in the equipment – yes, our sim is great at putting equipment to the test. For example, Bridgestone put a FSG simulator in a trailer and took it on the road for a couple of years doing ball-fittings at golf events all over the continent. If you put an Iron Byron in the sim and simply switched out the equipment, the sim would detail the differences in performance for you. GolfTheUnitedStates.com: Terrific. These systems are not inexpensive... do you envision a day when the price will come down? Coleman: It’s tough to predict the future, but I expect prices to trend down slowly -- but more slowly than people might expect. Swing Catalyst supplements the Full Swing system, providing even more data for golf instructors. If we were selling the same components we were offering 5 or 10 years ago, of course our simulator would be a fraction of today’s price. But as projectors, computers, software, ball-tracking technologies and all other components continue to get better -- we always buy the higher-end -- and we continue to invest big $$ into R&D. We intend to stay cutting-edge and industry-leading, which isn’t cheap. GolfTheUnitedStates.com: Is Full Swing available all over the country? How is it installed? Coleman: Full Swing Golf simulators are available all over the US and in most countries in the world. We have a network of full-time FSG installers who travel 22 out of 22 business days a month performing FSG sim installations. All of our installers have been on staff for many years, so they’ve seen it all. Our customers are in great hands. 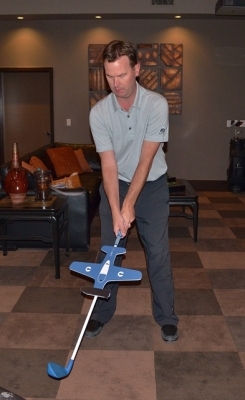 Joe Rathburn demonstrates how the airplane model can reveal the correct way to swing a golf club. Installation is more of a process than people might expect. First, we exchange shop drawings with the architect and builder, giving customers a 3D rendering of our simulator in their space, and giving the construction team a solid blueprint to follow to prepare the space. We also perform site surveys, where our techs walk the space with the construction team to make sure electrical and conduit are in place before drywall goes up. We also recommend a rough-in installation, which allows construction teams to make the sim look built-in. Final delivery includes comprehensive electronics installation and training. 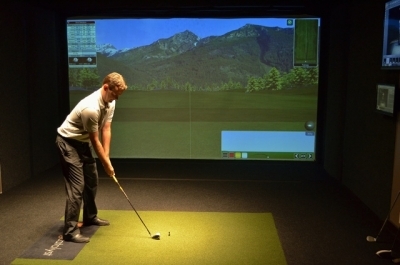 GolfTheUnitedStates.com: Can the simulator space be used for additional purposes, such as a theater room, etc…? Coleman: The FSG sim can be used for a variety of applications in addition to golf. There is nothing quite like having a driving range in your own home. Many of our residential customers also use our sims for high-end home theater, video gaming and other multimedia applications. FSG customers have also integrated other simulations, including car racing, hunting, cycling, and darts simulation games into their systems. There is nothing like watching the big game on the 210” Widescreen. GolfTheUnitedStates.com: Almost better than being there. What’s the most compelling argument in favor of golf simulators? Coleman: Let’s shift gears and look at what golf simulators can do to help grow the game of golf. 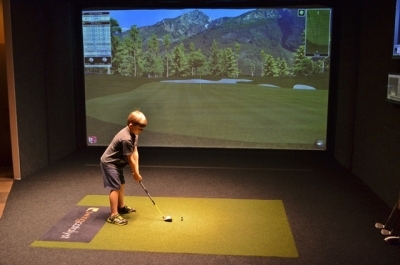 Simulators can help kids learn to love golf indoors - and outdoors, too. - Kids: We’ve combined technology and golf, the best of both worlds -- kids just get it instantly. 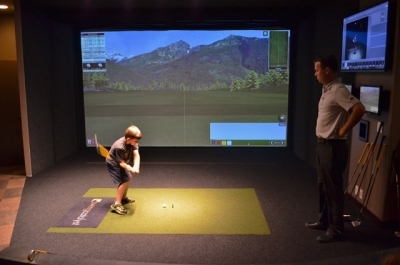 Simulators bring kids to the game of golf, and the game of golf to the kids. - Women: We have dozens of customers whose wives and daughters have picked up the game as a result of owning our simulator. The range and the course can be an intimidating place to try to learn and the simulator provides a private, safe environment for women to fall in love… with golf! - Climate: So many golfers are lost during the winter months -- the clubs go into storage and never come out again. Many of our golf course customers are able to continue their fall leagues right through the winter on the simulators, then into the spring again. This means they can hang on to their teaching and food/beverage staff and revenues, too. - Pace of play: Time is short, and we all have less of it. A round on the simulator is half the time of a round outdoors. No more driving up to your ball, or looking for it. The simulator gives golfers more reps in less time, more data, and keeps the game action packed. - Cost: A round of golf at your local indoor golf center, course clubhouse, rec center or sports bar is usually less than an outdoor round. With Full Swing, you can play great courses. Here, the famous par three 3rd hole at Spyglass Hill. As you just read, Coleman explains the benefits of golf simulators very well. Full Swing Golf’s simulator was impressive in every way – and there’s no getting away from the “cool” factor of being able to drive balls into a screen and receive data on your shot. I have no doubt the data was accurate, though I will say I was hitting a fair amount shorter than I do on a real golf course. But then again, we all think we hit it longer than we really do…! Full Swing’s former golf pro, Joe Rathburn, was able to demonstrate all sorts of shots on screen – fades, draws, low shots, high shots. Seeing someone who actually knows what they’re doing with the golf swing was inspiring. Once again, the simulator came through in all respects. Based on the data from about two dozen of my swings, Coleman and Rathburn were also able to diagnose where I was losing power in my golf swing. As a career long-hitting average player, it was interesting to see my swing motion analyzed right before my eyes. 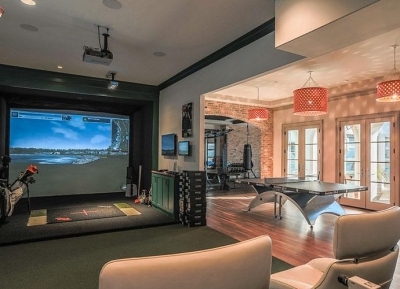 Here is a look at what your home could look like with a Full Swing golf simulator. Photo from Full Swing Golf. In addition, Full Swing offers exercise equipment and tools to practice the concepts explained by a teaching professional using the simulator data. I can easily see how it would be very helpful to participate in a series of lessons – and then enjoy real improvement through utilization of the devices. We also took chips and putts in the simulator – and like with everything else, it was extraordinary to see how even short shots are accurately portrayed. This is one area where outdoor practice will likely remain more effective, but your short game will only get better with indoor work as well. If there was a part of golf where simulators are a tad weak, it’s in simulated shots from deep rough and bunkers. Coleman candidly admits it’s very hard to replicate these types of shots, but Full Swing has developed a special mat to imitate sand and rough. The Full Swing simulator can also be paired with the products from Swing Catalyst (amongst other partners), giving you yet another dimension in assessing your golf swing. As mentioned above, simulators for your home are very expensive – but the price is much more affordable if spread out through prolonged public access. This is how most of us are likely to encounter Full Swing Golf simulators, and I look forward to the next opportunity to try them again. There’d be nothing quite like playing with your favorite foursome on a famous course from your own set of tees – or even challenging the tips, where the pros play. One thing’s for sure, we are believers. Full Swing Golf’s simulators are the real deal.